AD sign eastbound on Carsons Siding Road approaching Castlereagh Highway, Cullen Bullen. Source: Dean Pryke, July 2013. 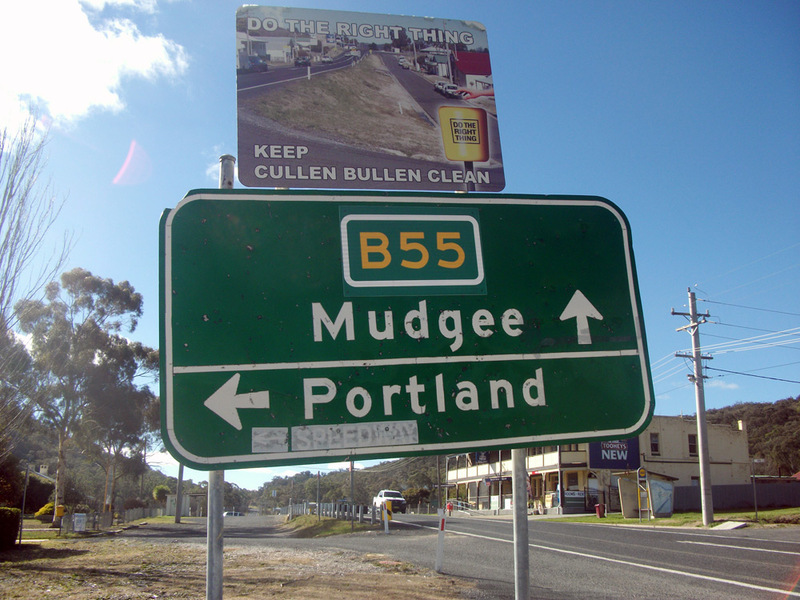 Route B55 provides a north-south link through central west New South Wales, linking Sydney (via the Blue Mountains) with Mudgee, Gulgong, Gilgandra and the towns along the Castlereagh River. 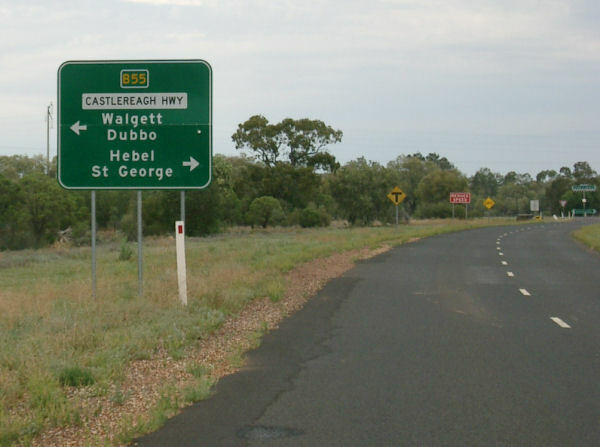 Following the Castlereagh Highway for its entire length in NSW, it directly replaces the former State Route 86 (Marrangaroo-Gilgandra) and National Route 55 (Gilgandra-Hebel). 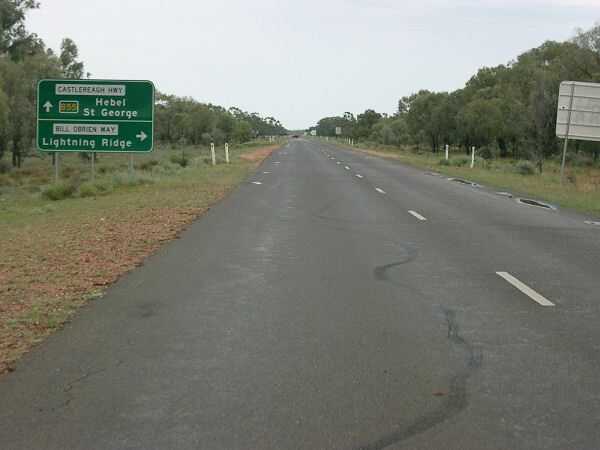 Crossing the border Queensland, the route continues north along the Castlereagh and Carnarvon Highways via St George to terminate on the Warrego Highway near Roma. 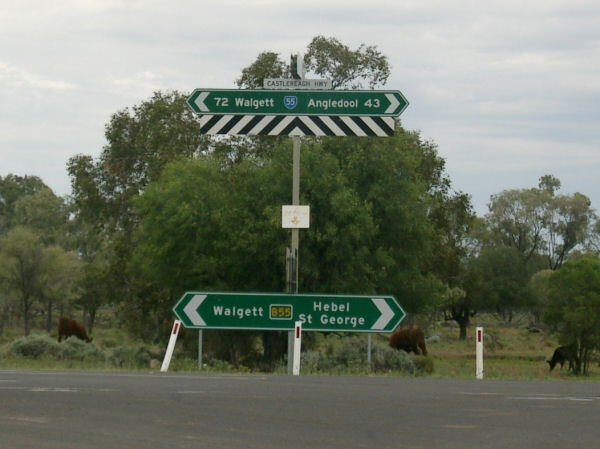 The first exposed B55 route markers were spotted in November 2005 by Paul Rands at the Lightning Ridge turnoff, followed by several uncovered B55 route markers on new signs through Coonamble and Walgett in April 2006. The southern portion of B55 (replacing State Route 86) formed part of the first stage alpha-numeric rollout and appears to have been largely completed by June 2013. Signage along this section is a mixture of recent alpha-ready signage (e.g. 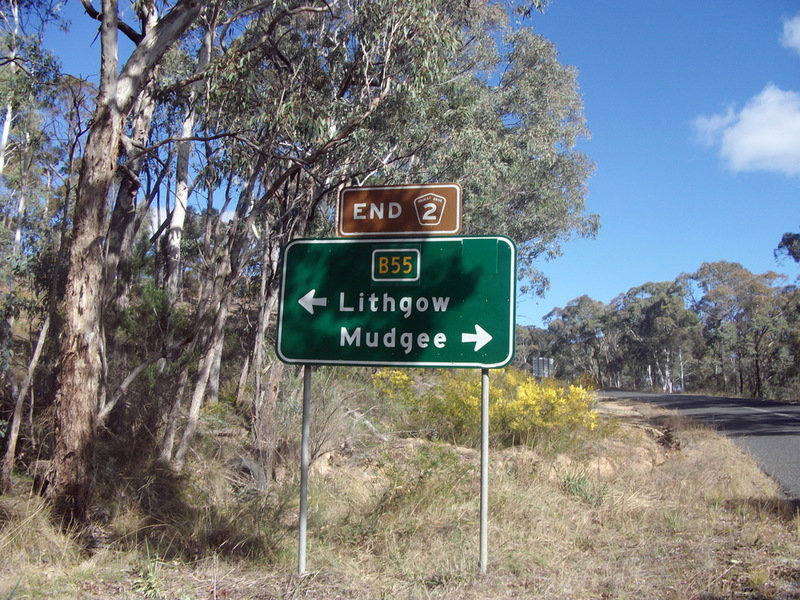 Mudgee to Dunedoo) and older signage with coverplates (e.g. Cullen Bullen to Ilford). 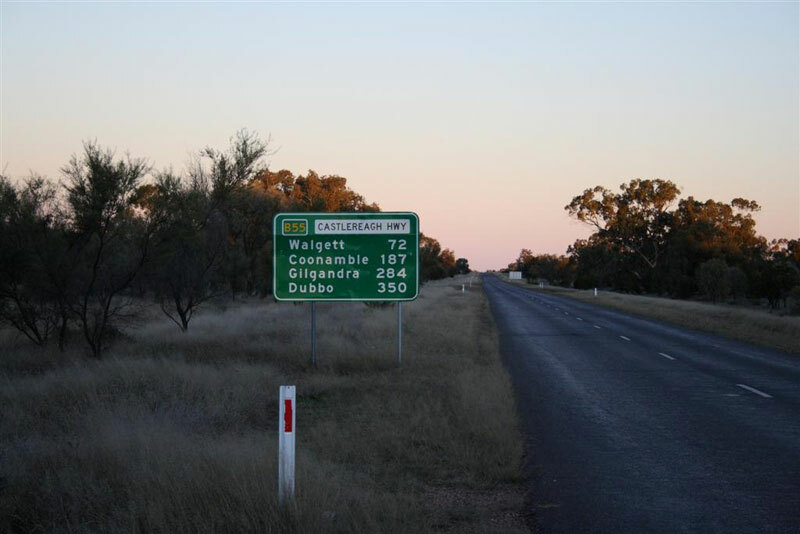 The status of the section from Gilgandra northwards (replacing National Route 55) is not yet known. 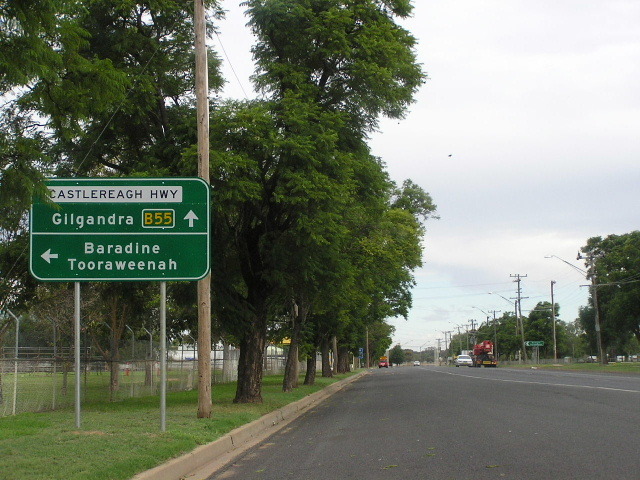 Signage erected in 2008 on the short Newell Highway section approaching Gilgandra failed to incorporate the A39/B55 duplex. It is not yet known whether this situation has been rectified as part of the 2013 alpha-numeric rollout. ID sign facing the eastbound off-ramp from the Great Western Highway at Marrangaroo. Source: Dean Pryke, July 2013. 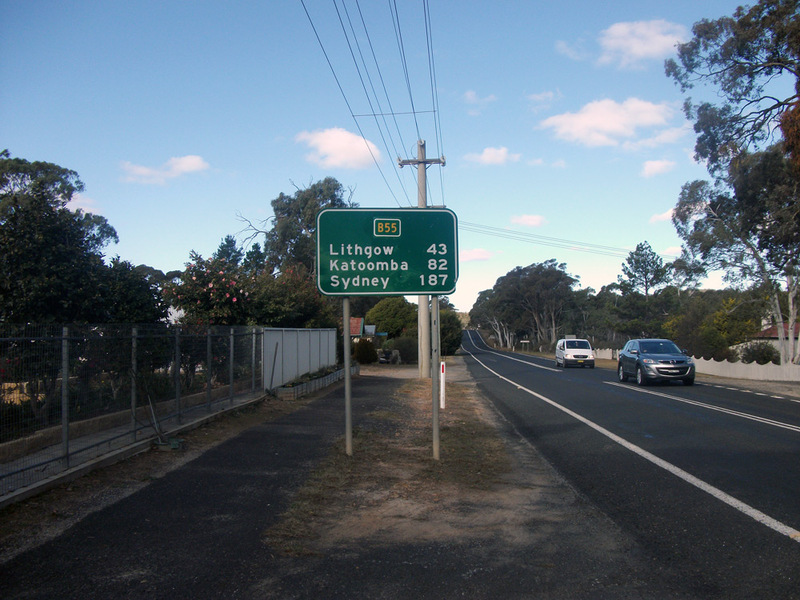 Brand new RD sign northbound on Castlereagh Highway after the junction with Great Western Highway, Marrangaroo. This sign was installed in 2012. 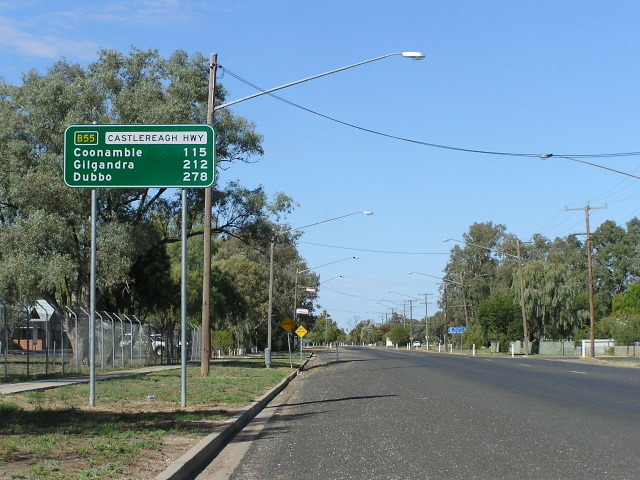 RD sign southbound on Castlereagh Highway after the junctions with Wolgan Road & Main Street, Lidsdale. 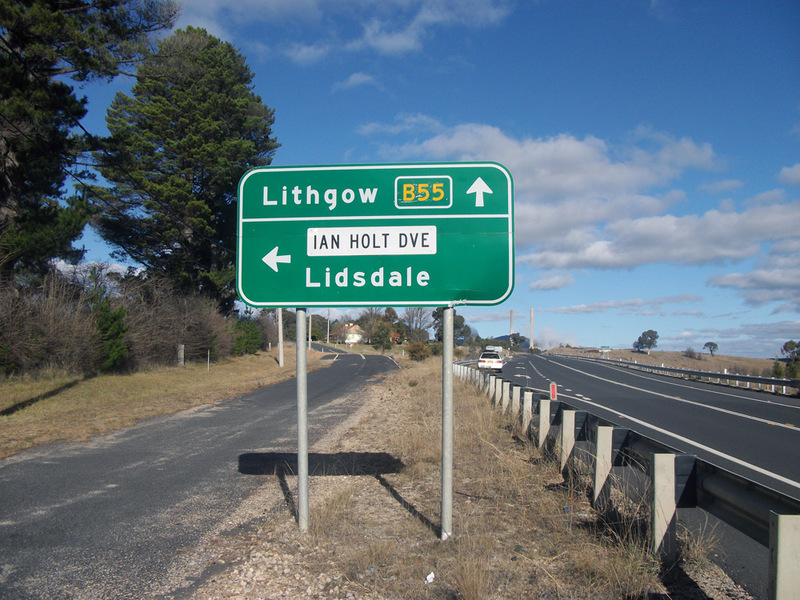 This sign was installed in 2005 as part of the Lidsdale Deviation project. 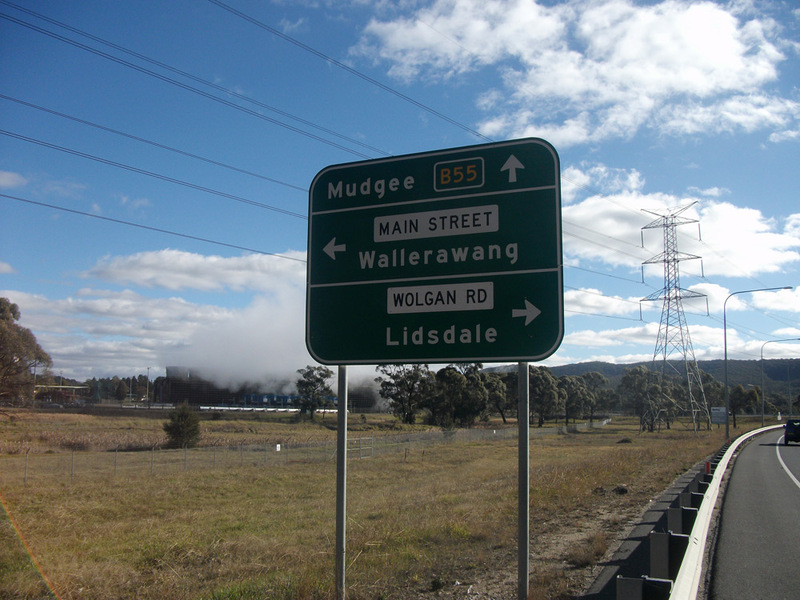 AD sign northbound on Castlereagh Highway approaching the junctions with Wolgan Road & Main Street, Lidsdale. 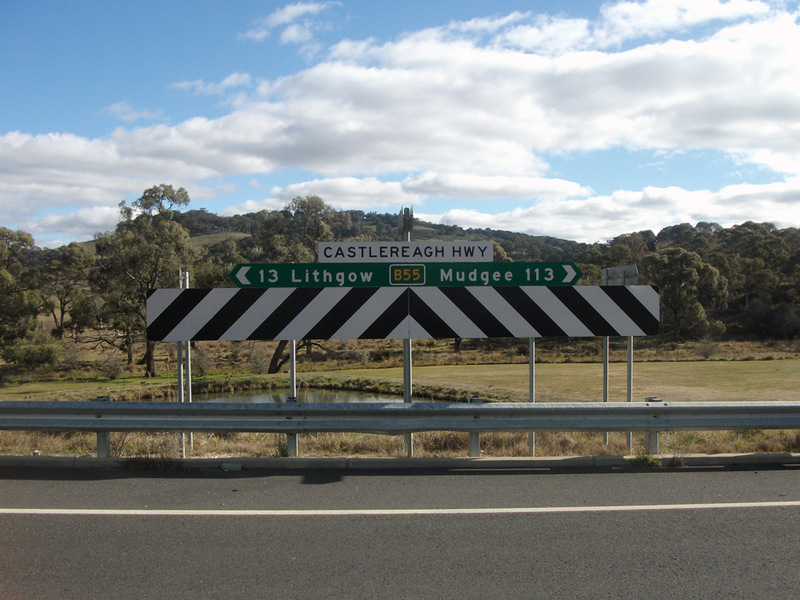 Fingerboard sign assemblies at the junction of Castlereagh Highway & Wolgan Road, Lidsdale. 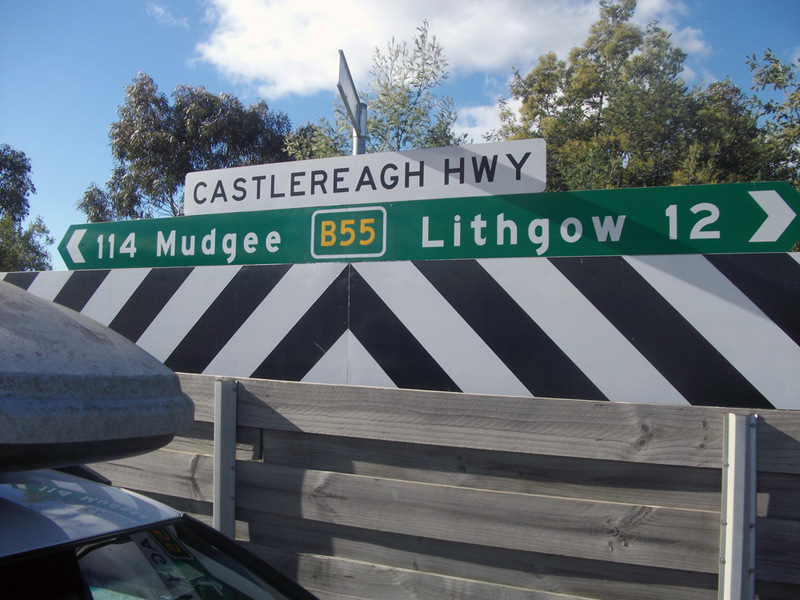 Fingerboard sign at the junction of Castlereagh Highway & Main Street, Lidsdale. 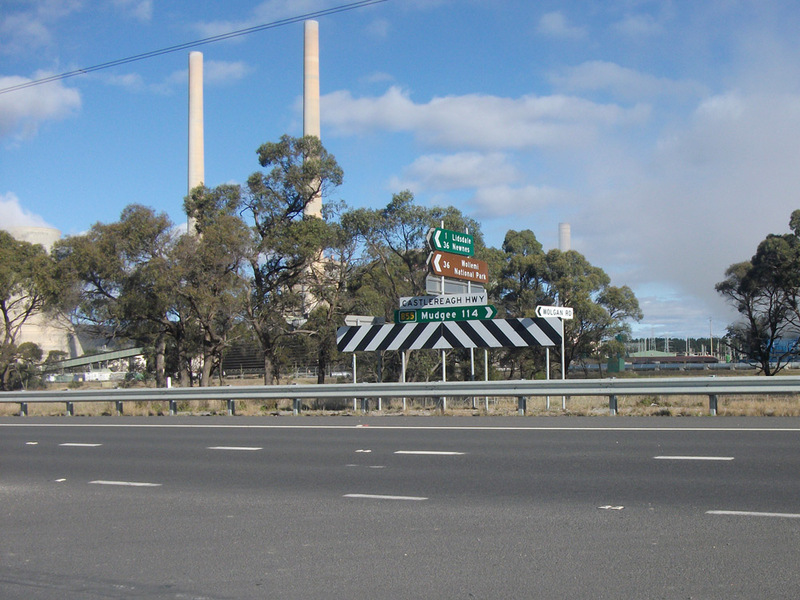 AD sign southbound on Castlereagh Highway approaching the junctions with Wolgan Road & Main Street, Lidsdale. 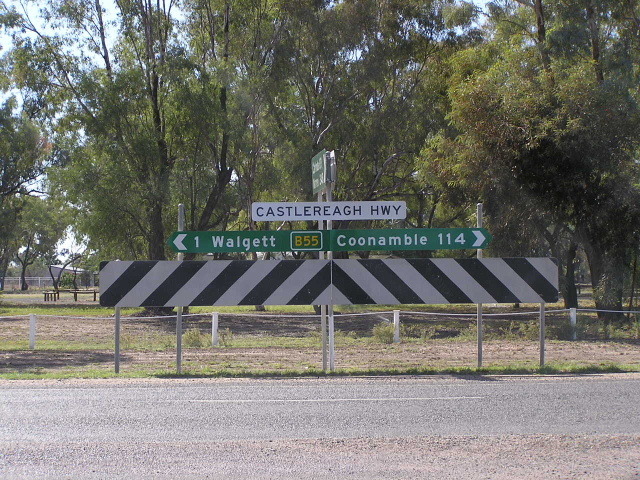 Fingerboard sign at the junction of Castlereagh Highway & Brays Lane, Lidsdale. 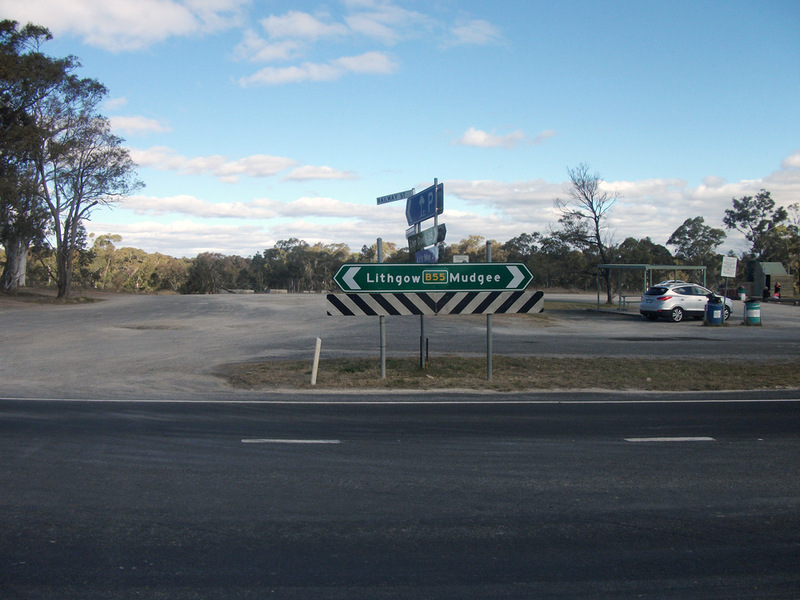 Fingerboard sign at the junction of Castlereagh Highway & Ian Holt Drive (former Castlereagh Highway), Lidsdale. 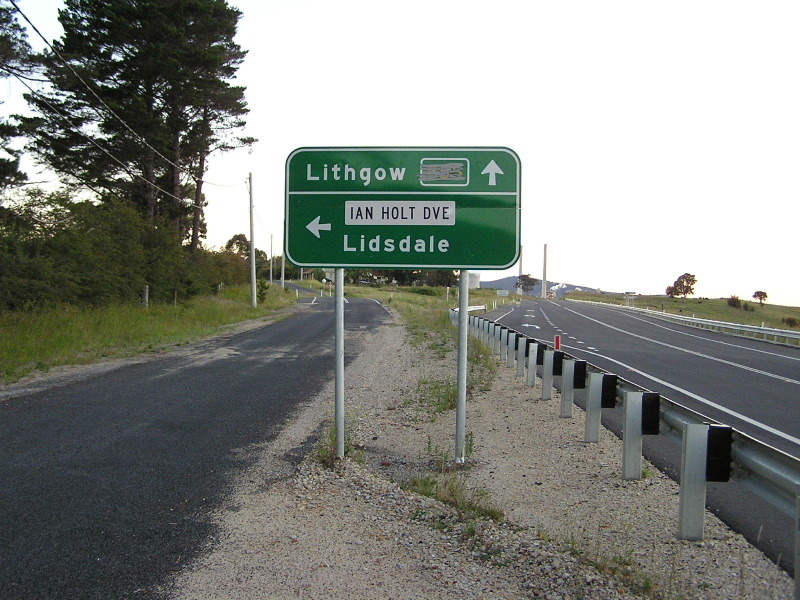 AD sign southbound on Castlereagh Highway approaching the junction with Ian Holt Drive (former Castlereagh Highway), Lidsdale. 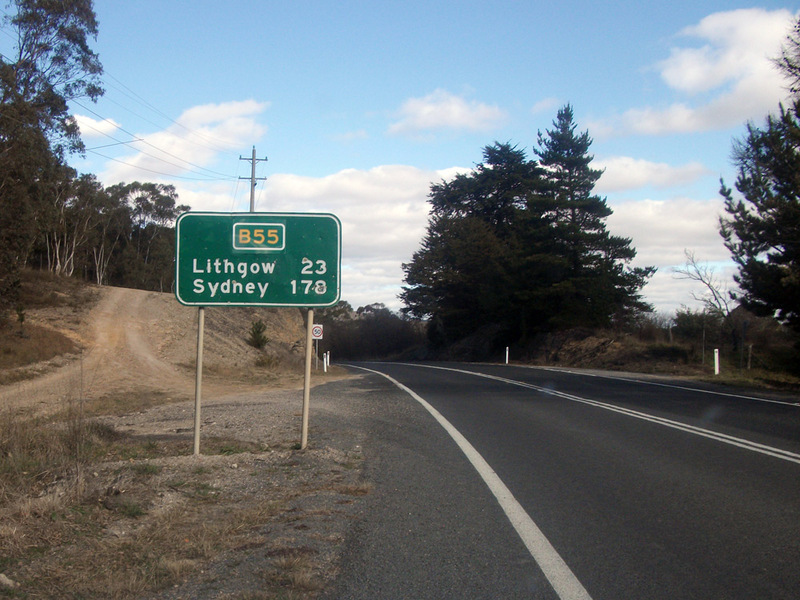 This sign was installed in 2005 as part of the Lidsdale Deviation project and, for some strange reason, was never coverplated, only covered with tape. The bottom two photos show the state of the tape covering the B55 route marker in December 2007 - by 2012 the tape had almost completely disappeared. Top photo: Dean Pryke, July 2013. Middle and bottom photos: December 2007. 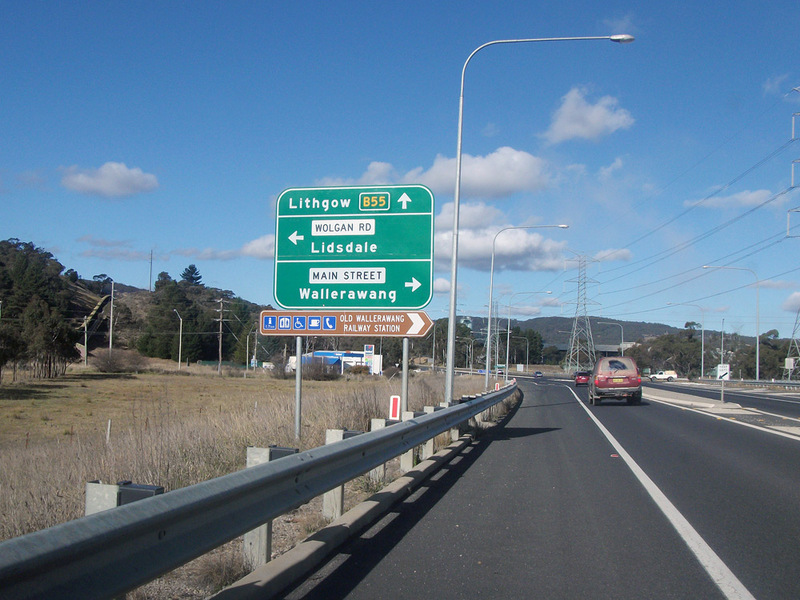 RD sign northbound on Castlereagh Highway after the bridge over Coxs River, Lidsdale. 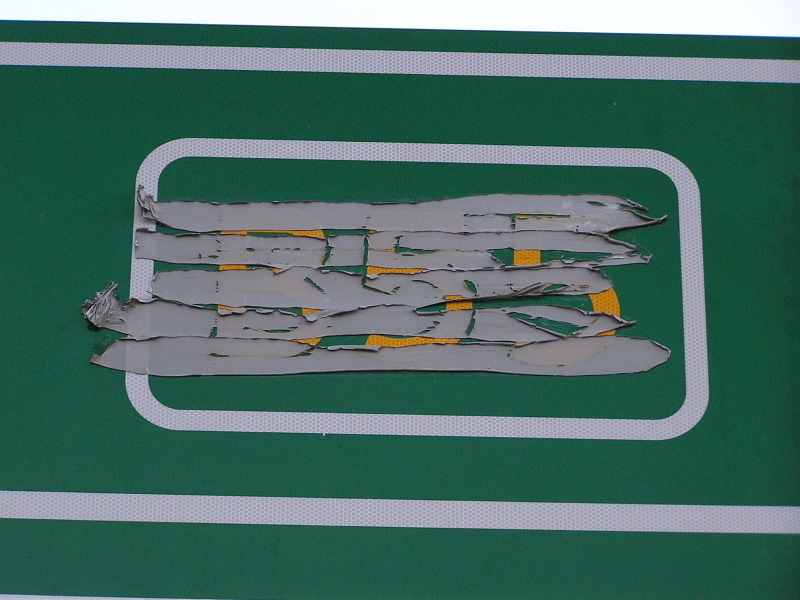 Coverplated RD sign southbound on Castlereagh Highway after Cullen Bullen. Coverplated AD sign northbound on Castlereagh Highway approaching the junction with Carsons Siding Road, Cullen Bullen. Coverplated AD sign eastbound on Carsons Siding Road approaching the junction with Castlereagh Highway, Cullen Bullen. 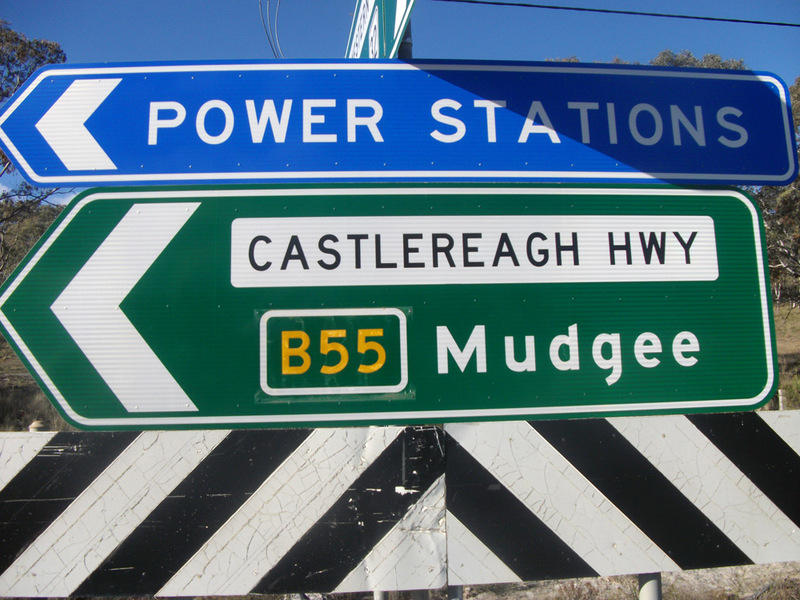 Coverplated ID sign at the junction of Castlereagh Highway & Carsons Siding Road, Cullen Bullen. 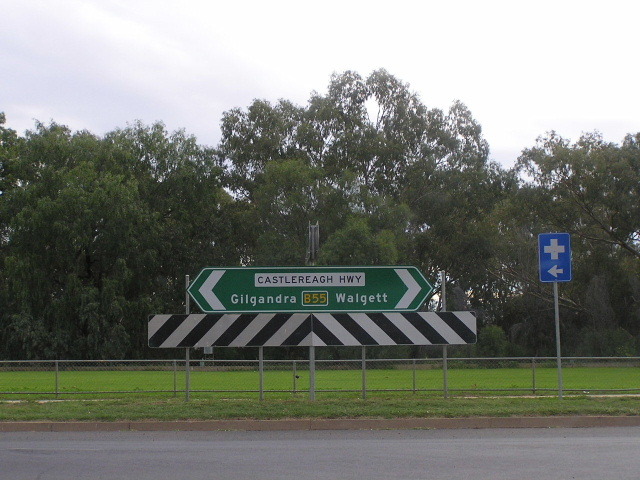 Coverplated AD sign southbound on Castlereagh Highway approaching the junction with Carsons Siding Road, Cullen Bullen. 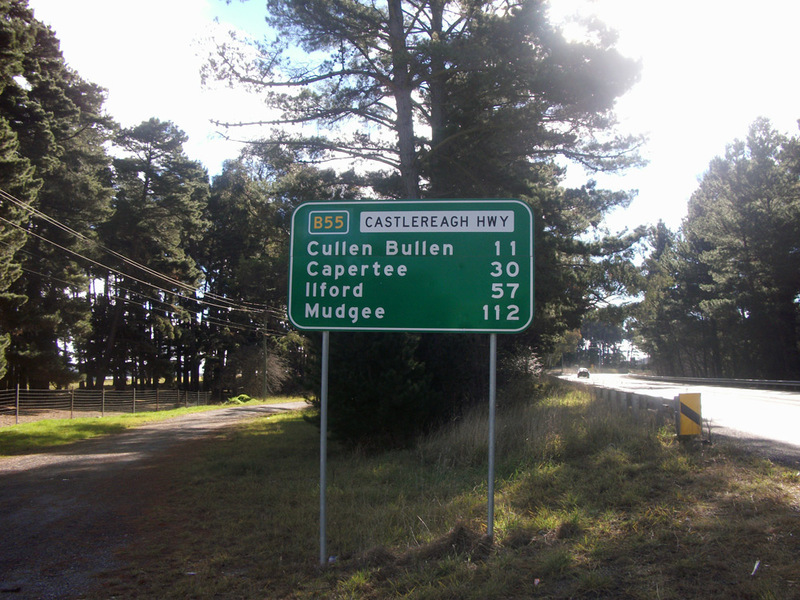 Coverplated RD sign northbound on Castlereagh Highway after the junction with Carsons Siding Road, Cullen Bullen. 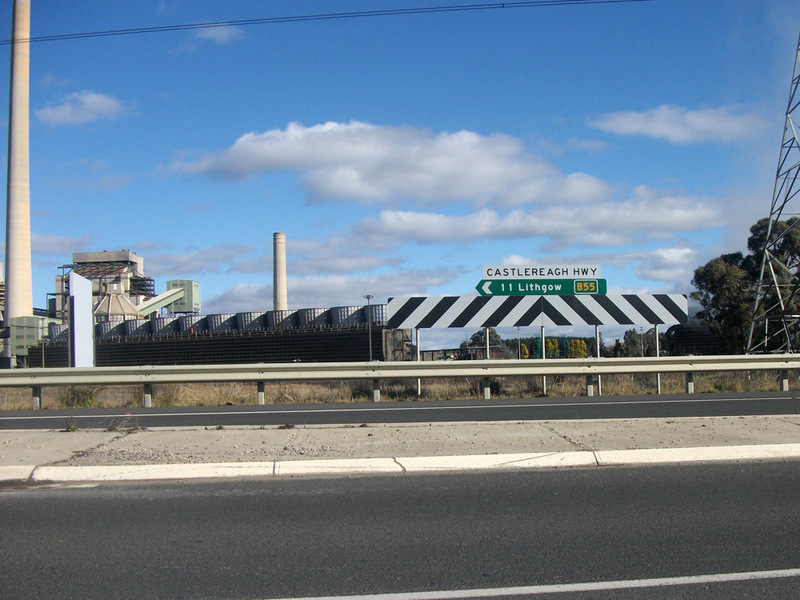 Coverplated ID sign facing southbound traffic at the Ben Bullen railway level crossing. 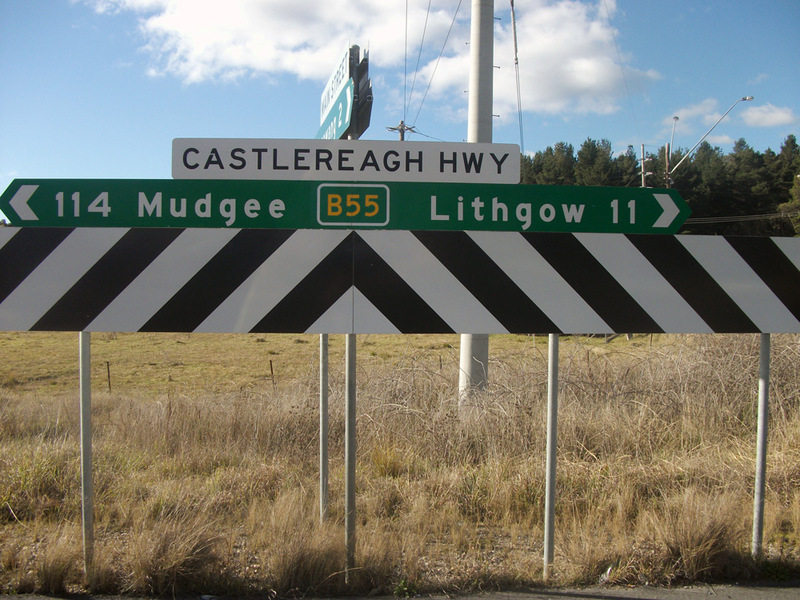 RD sign southbound on Castlereagh Highway at Capertee. 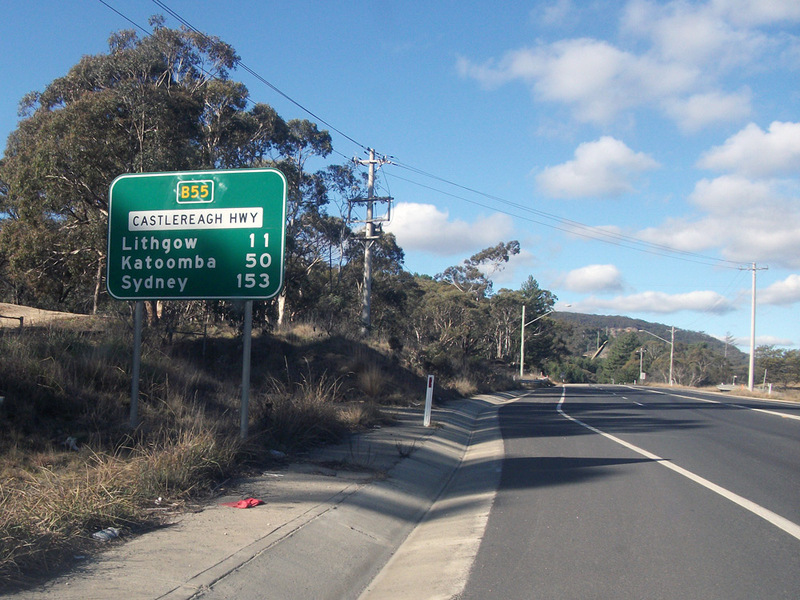 AD sign northbound on Castlereagh Highway approaching the junction with Glen Davis Road, Capertee. 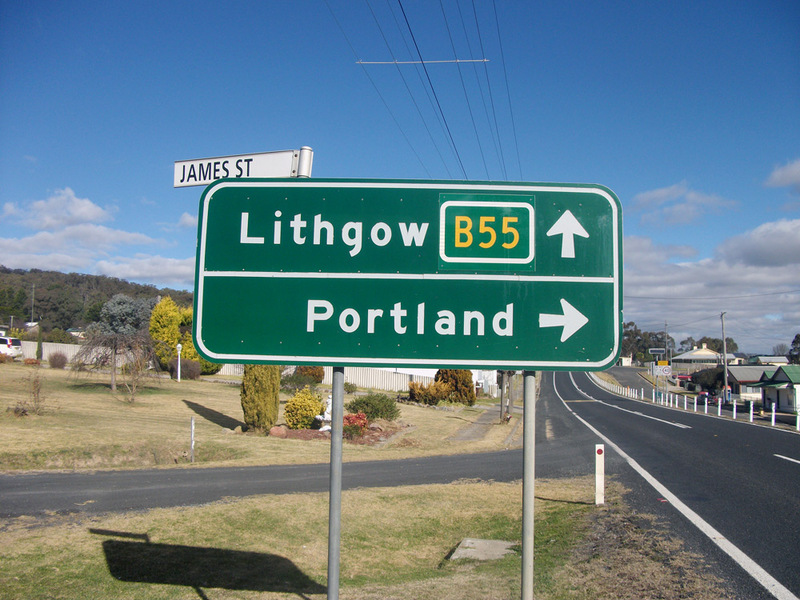 Coverplated ID sign at the junction of Castlereagh Highway & Glen Davis Road, Capertee. 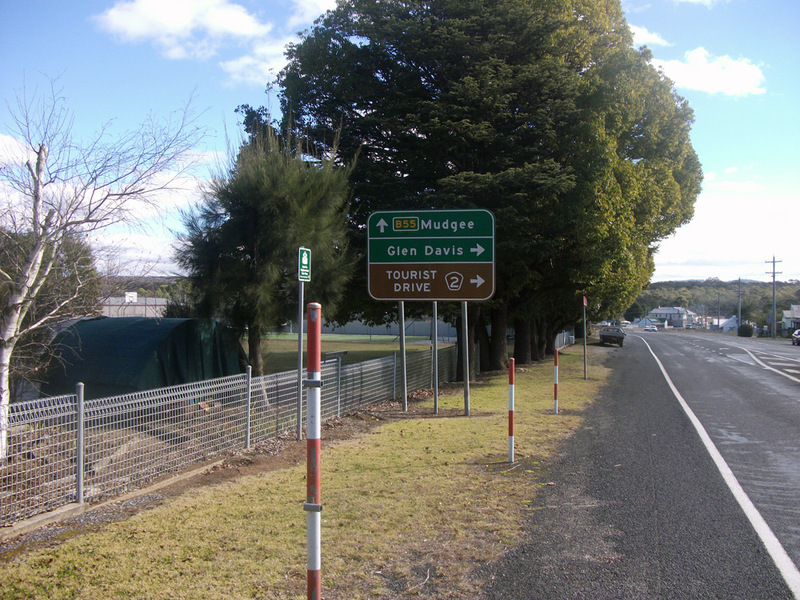 Coverplated AD sign westbound on Glen Davis Road approaching the junction with Castlereagh Highway at Capertee. Note the blank coverplate on the top right of the sign covering the former RTA logo. 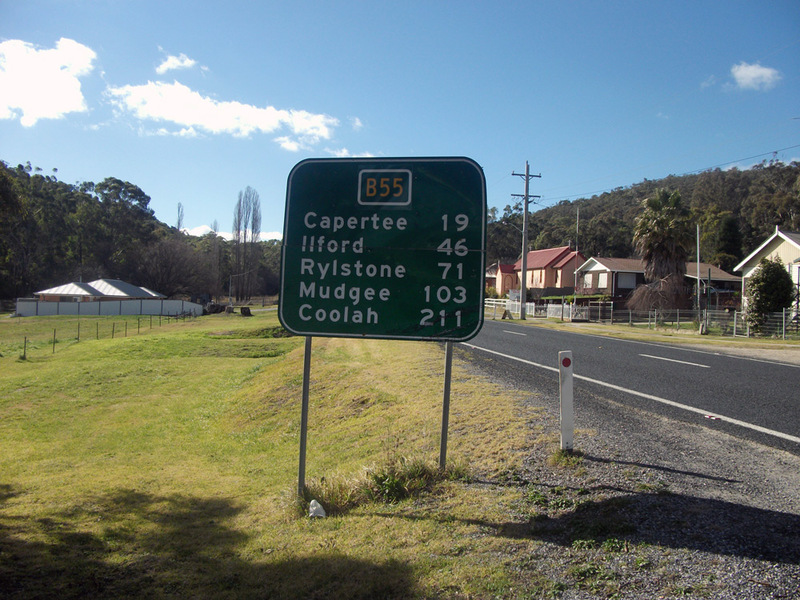 RD sign eastbound on Golden Highway as you leave Dunedoo. Note that only the B84 route marker is shown - there should, of course, also be a B55 route marker. 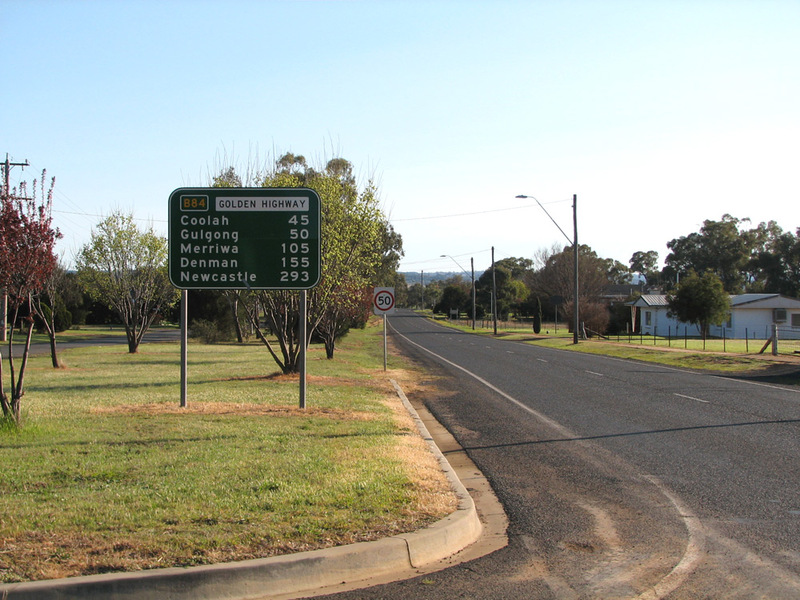 Prematurely uncovered B55 route marker on an AD sign northbound on Castlereagh Highway approaching the junction with King Street, Coonamble. 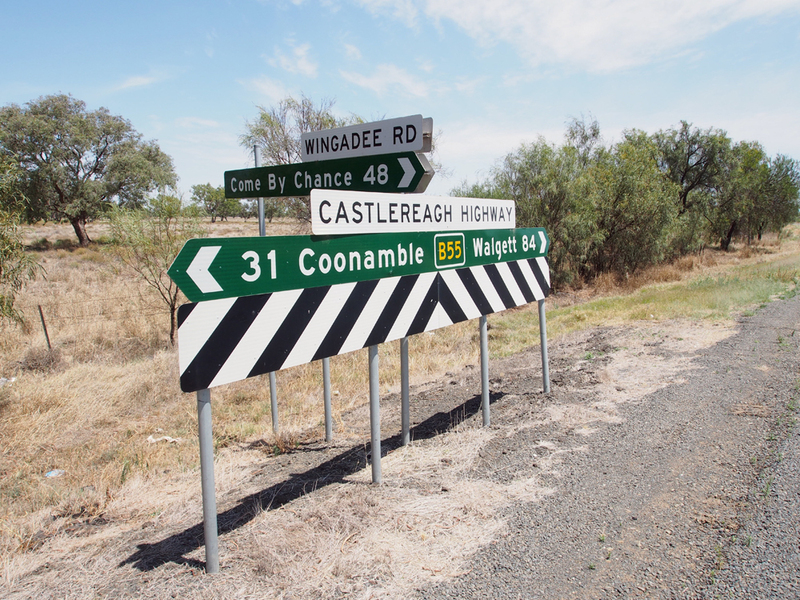 Prematurely uncovered B55 route marker on an ID sign at the junction of Castlereagh Highway & King Street, Coonamble. 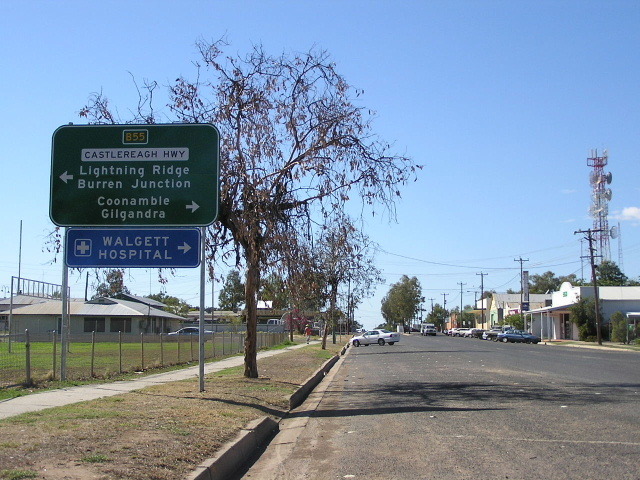 Prematurely uncovered B55 route marker on an AD sign southbound on Castlereagh Highway approaching the junction with King Street, Coonamble. 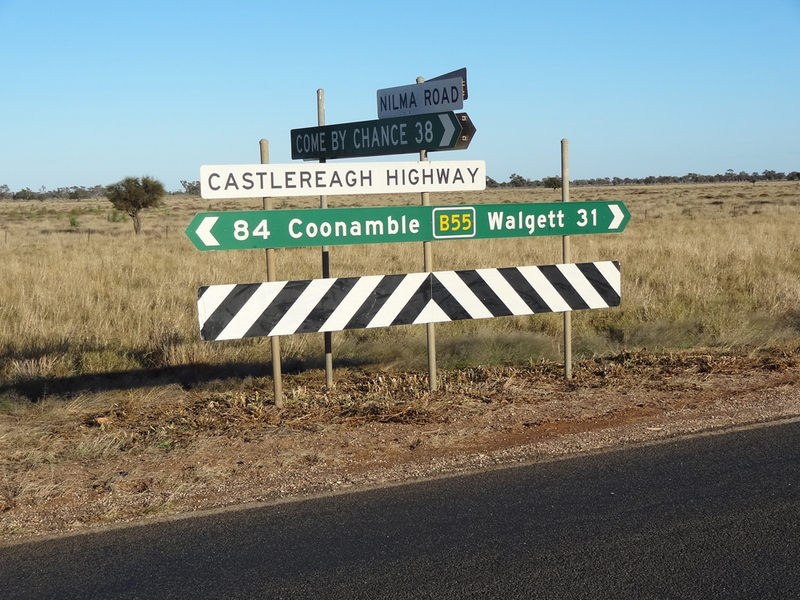 Prematurely uncovered B55 route marker on a fingerboard sign at the junction of Castlereagh Highway & Wingadee Road, 31km north of Coonamble. Source: Peter Renshaw, June 2012. Prematurely uncovered B55 route marker on a fingerboard sign at the junction of Castlereagh Highway & Nilma Road, 31km south of Walgett. Prematurely uncovered B55 route marker on a fingerboard sign at the junction of Castlereagh Highway & Bate Street, Walgett. 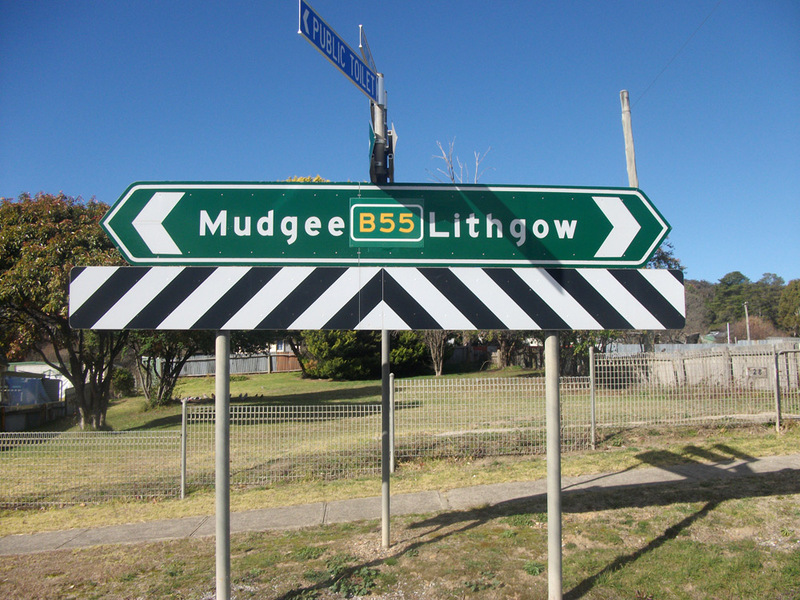 Prematurely uncovered B55 route marker on an RD sign, southbound on Castlereagh Highway at Walgett. Prematurely uncovered B55 route marker on a fingerboard sign at the junction of Castlereagh Highway & Euroka Street, Walgett. 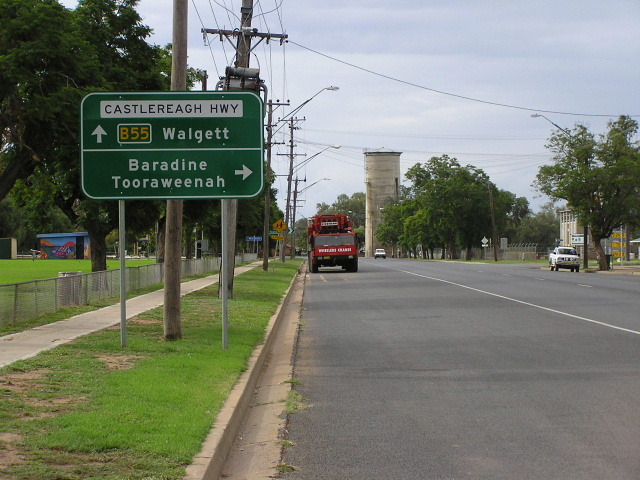 Prematurely uncovered B55 route marker on an AD sign eastbound on Kamilaroi Highway (Wee Waa Street) approaching the junction with Castlereagh Highway (Fox Street), Walgett. Note the missing B76 route marker which should be provided for the left turn - presumably this has since been included in the sign as part of the alpha-numeric rollout in 2013. 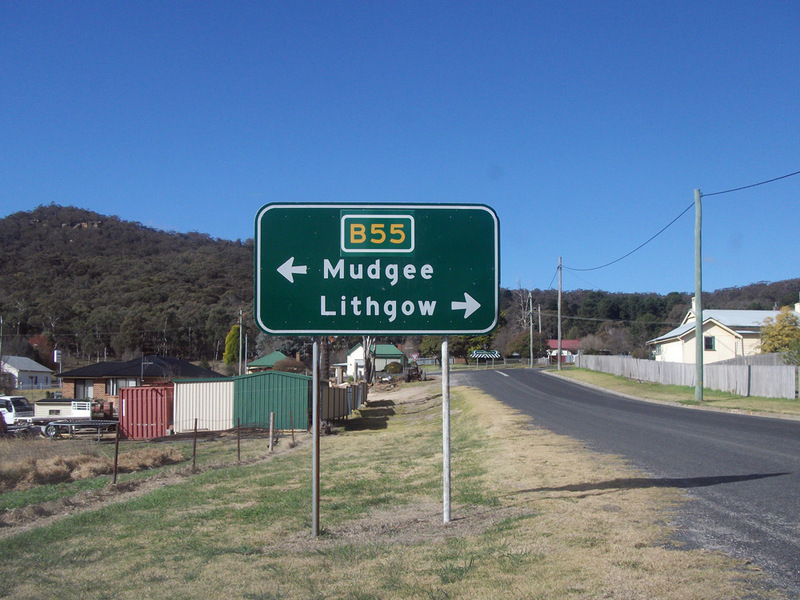 Prematurely uncovered B55 route marker on an RD sign northbound on Castlereagh Highway approaching the bridge over the Namoi River, Walgett. Note the missing B76 route marker - presumably this has since been included in the sign as part of the alpha-numeric rollout in 2013. 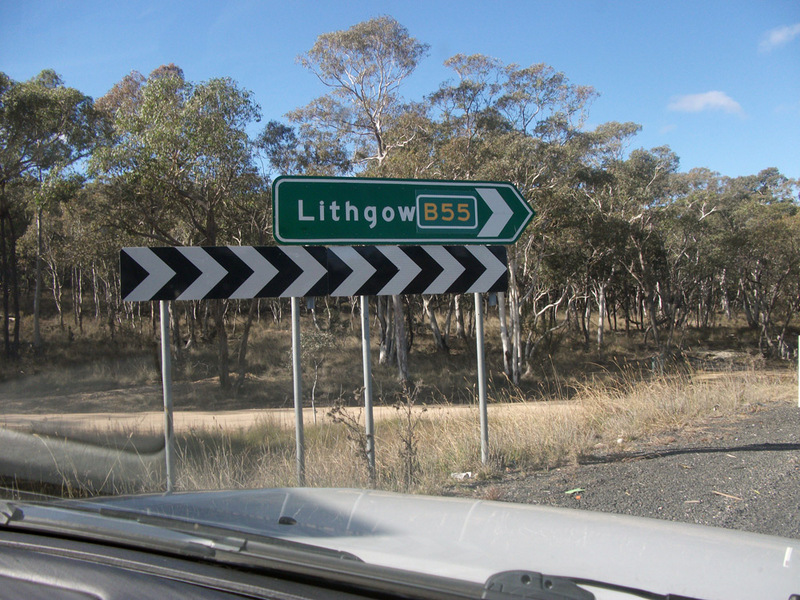 Prematurely uncovered B55 route marker on an RD sign southbound on Castlereagh Highway after the junction with Bill O'Brien Way, 5km west of Lightning Ridge. Source: Richard Wardle, June 2009. 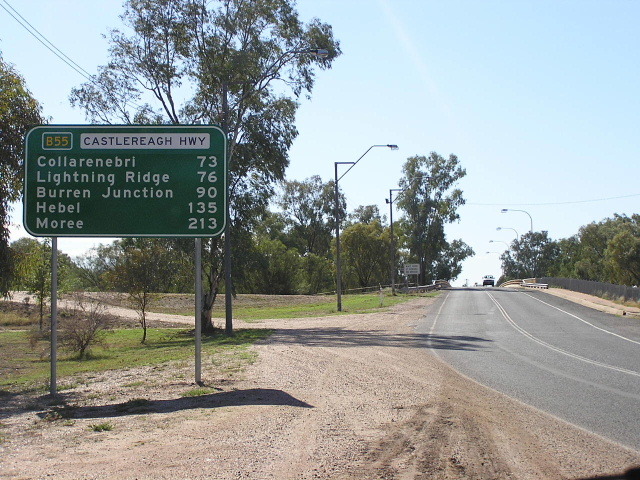 Prematurely uncovered B55 route marker on an AD sign, northbound on Castlereagh Highway approaching the junction with Bill O'Brien Way, 5km west of Lightning Ridge. Source: Paul Rands, November 2005. 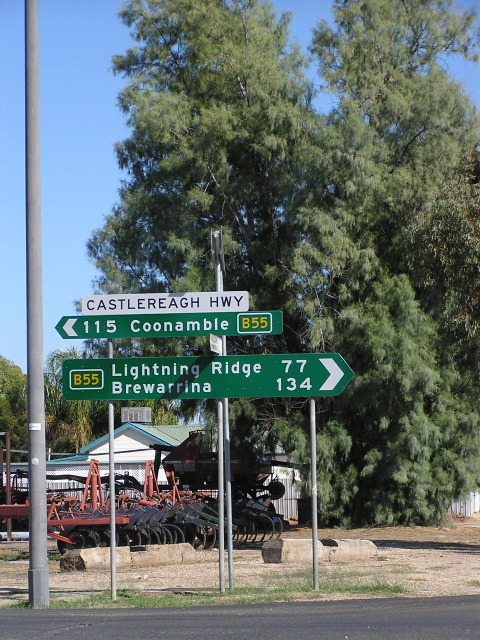 Interesting sign assembly - an incorrect State Route 55 route marker and a prematurely uncovered B55 route marker at the junction of Castlereagh Highway & Bill O'Brien Way, 5km west of Lightning Ridge. 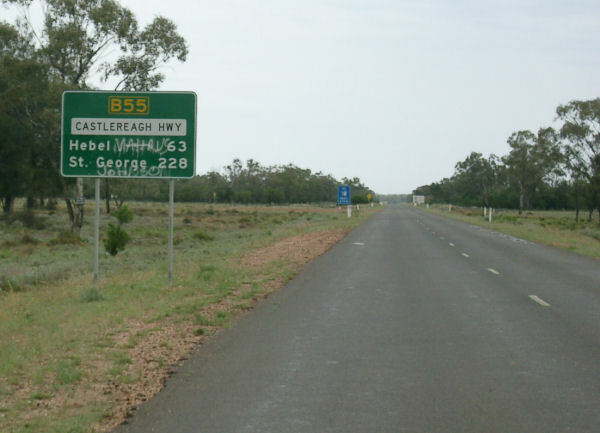 Prematurely uncovered B55 route marker on an AD sign, westbound on Bill O'Brien Way approaching the junction with Castlereagh Highway, 5km west of Lightning Ridge. 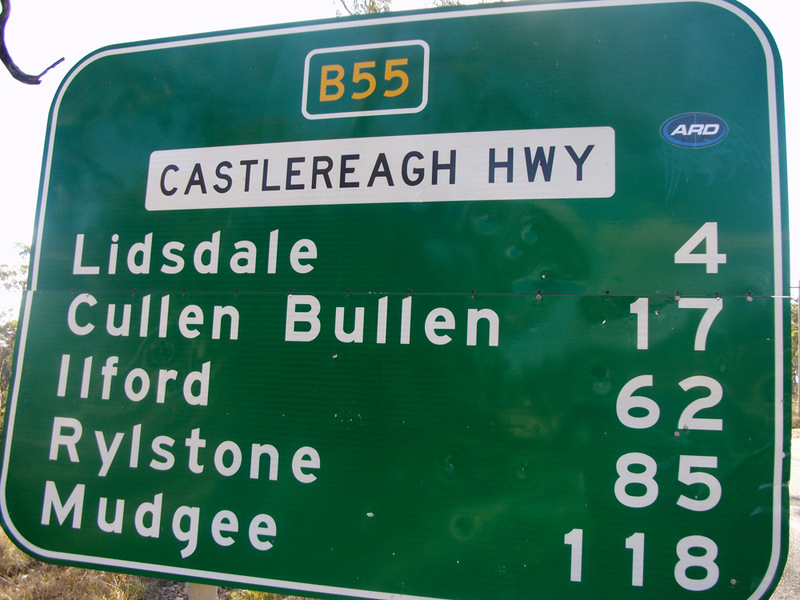 Extremely dodgy, prematurely uncovered B55 route marker on an RD sign, northbound on Castlereagh Highway after the junction with Bill O'Brien Way, 5km west of Lightning Ridge.